While Replicas was panned at the box office I would give the film a chance if you are a Keanu Reeves fan. Cloning is a hot button topic in today's world. We have the ability to do so but, the question is, should we? Those who have lost a beloved family member/friend or pet knows the feeling of wanting them back. In Replicas, we see what happens when the grips of grief and despair take over and you'll do anything to achieve that goal. Now, you get caught up in all of the drama and add this film to your home entertainment collection. Keanu Reeves (John Wick: Chapter 3 - Parabellum) plays William Foster, a biomedical research scientist. He and his team, which includes Ed (Thomas Middleditch; Silicon Valley), are working for Bionyne Industries, where they are trying to transfer brains from military cadavers into androids. The project isn't going well and they are getting a lot of fo pressure from their bosses to get it right or it will be terminated altogether. A new sense of purpose comes to Foster, however, after his wife and three children are killed in a car crash. He creates a lab in his own basement and enlists the help of Ed (along with some stolen lab equipment) to bring his family back to life. As expected, nothing goes quite as planned, and things quickly descend into chaos. As usual, Keanu Reeves is at the top of his game and this being his passion project (as well as producing it) he brought his A-game to every scene. The supporting cast does a fine job as well exploring their characters and life events that affect them, However, if you could put your finger it, the one issue that Replicas has is a very uneven script. While it has some emotional moments that certainly draw you in (as a father there is a particular scene that is heart-wrenching to watch) they are followed up by scenes that take you out of any emotional investment you just made in the film. Technically the story is not a bad one, it just really needed a script doctor. Replicas is presented in 1080p AVC in its original theatrical aspect ratio of 2.40:1. The video is unfortunately not the best presentation that Lionsgate could have given this property. The color palette is extremely muted and most of the outlines of clothing or even hair seem dull and fuzzy. While this could have been a direct choice by the filmmakers, it really did not play well on screen. Hopefully, a more punched up version will come up in the future. The audio, presented in DTS-HD Master Audio 5.1 fares much better as dialog and special effects are evenly mixed. Subtle special effects are used properly with sounds coming from every angle whether it be a door creak or a robot ripping itself to pieces. The Replicas Blu-ray combo pack comes with a DVD, as well as a digital copy of the film. Also included is an Audio Commentary with Director Jeffrey Nachmanoff and Executive Producer James Dodson, a twenty-five-minute feature entitled "Imprint Complete: The Making of Replicas", and two deleted scenes. While Replicas was panned at the box office I would give the film a chance if you are a Keanu Reeves fan. While it isn't The Matrix or John Wick it is certainly not a Johnny Mnemonic. Trust Me, you might be pleasantly surprised. Download Replicas from the iTunes Store in Digial HD. 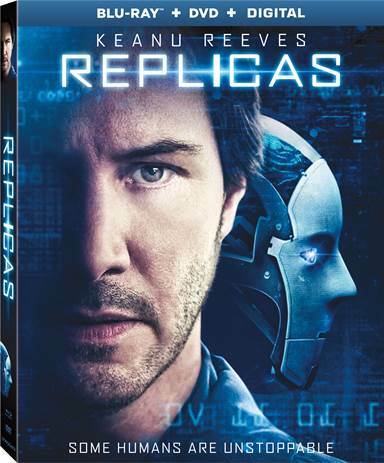 For more information about Replicas visit the FlickDirect Movie Database.